English almuni gather after giving short presentations to current English majors about their careers after UW-Platteville. On Oct. 12, the English Department hosted their first Professional Writing Career Day in the newly-remodeled Lundeen Lecture Hall. 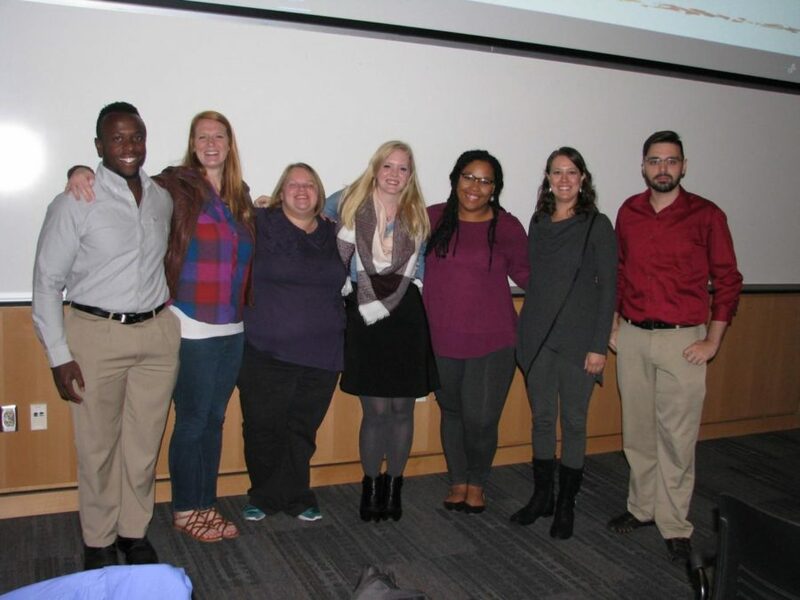 This event was geared towards English majors and minors who were curious about what they can do with their humanities degrees, and it allowed those students to talk with peers who have been exactly where they are now. The English Department brought in seven alumni to talk about what their experiences have been since graduating with an English degree. All of the presenters received their degrees in professional writing, and their jobs now range from technical writers, to content licensers, to admission advisors. The first four presenters were all alumni who had graduated in or before 2015, and they are all successfully working jobs or working towards higher degrees. The first presenter, Brianna Kirschbaum, a 2012 graduate, is working as a content licensing specialist for McGraw Hill. When Kirschbaum first graduated from University of Wisconsin-Platteville, she became an assistant in the Writing Center here on campus, as well as working with the Stylus. After some time, Kirschbaum received her master’s in publishing, where she learned valuable skills that helped her receive the job she has today. “One thing publishing houses are looking for is computer skills,” Kirschbaum told the audience when she was reflecting on what skills she wished she had developed more in her undergraduate degree. Kirschbaum wrapped up her presentation by sharing the freelance opportunities she has been able to experience. The next presenter was Antonio Bouxa, a 2015 graduate, who now owns his own business and works as a proposal systems consultant. Bouxa focused primarily on the way to be successful in what you want to become. He told the audience to not allow your humanities degree define your job and make it what you want. Bouxa emphasized the point that individuals can do many things with a humanities degree and no stigma should be placed on that. He then went on to talk about expectations that individuals are held to within those jobs and how to best understand and work with them. “Communication is critical, and you cannot let your degree define what you do,” Bouxa said. The last of the four alumni to graduate before 2015 was Sara Doan, a 2012 graduate who is currently a writing instructor and is pursuing her doctorate in technical writing at UW-Milwaukee. Doan had an interactive presentation, which allowed the audience to engage with themselves and start a goal setting process. Doan asked the audience to generate a list of skills they believe to personally have, and then asked them to create a list of skills they wish to improve on. From this list, audience members were able to compare the skills they already had to those that they want to work on. Doan then went on to give advice as to what students should be doing in their undergraduate programs. “Do internships!” Doan said as one of her pieces of advice for undergraduate students. Doan finished her presentation with five thoughts students should have when thinking about graduate school. “Know why you are there, someone else should pay, don’t rush, it’s a journey, not a destination, and graduate school requires sacrifices,” Doan said. Following these four alumni were three alumni who had just graduated last year. These presenters were Emalydia Flenory, Kelsey Bigelow and Matt Mutiva. All three of these alumni talked about what they are doing now and how their degree has proven to be flexible. Flenory is working in the UW-Platteville Admissions Office as an admission advisor, Bigelow is working as an editor at Two Rivers Marketing, and Mutiva is working as a corrections officer for Wisconsin Secure Program Facility. The three talked about where their degrees have taken them, as well as where they hope to go. Mutiva explains how important it is to define your own happiness. “Don’t compare your success to anyone else’s,” Mutiva said. After the alumni presentations, associate dean of the College of Liberal Arts and Education Kory Wein gave a presentation on the internship credits that professional writing majors must complete. Wein gave the eight steps students should take to complete their writing and editing internship. “Speak with Wein, find an internship, secure it, complete the contract, enroll in English 4680, coordinate on-site visit midway, obtain supervisor evaluations, and write portfolio,” Wein said.